After a public records request, NBC Boston obtained more than 100 pages of documents, showing everything from what music he downloaded to conversations he had with inmates before his suicide. More than 100 pages of previously unreleased documents are shedding light on Aaron Hernandez's life in prison as well as the circumstances surrounding his death, including the bible that was marked with blood in his cell. The documents, which NBC Boston Investigators obtained through a public records request, include accounts from inmates who knew the former Patriots tight end. "Hernandez had recently mentioned a rumor ... if an inmate has an open appeal on his case and dies in prison, he is acquitted of his charge and will be deemed not guilty," one inmate told investigators. Hernandez had been serving a life sentence for the murder of Odin Lloyd and had an active appeal for that conviction. The documents describe the scene officials found when they discovered Hernandez hanged from his cell window. Photos show his Bible, which was marked with blood at John 3:16, a verse that describes eternal life for those who believe in God. 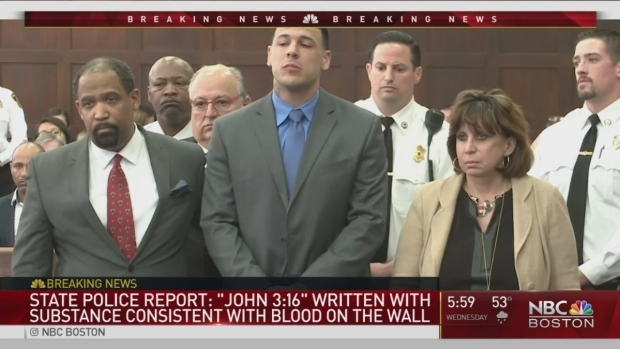 The verse name was also written in blood on the wall and in pen on Hernandez's forehead. According to the documents, Hernandez was given CPR and taken to a hospital after being found. The interviews give further weight to religious references found in Hernandez's cell, with inmates describing him as someone who "kept to himself, was very spiritual, appeared to be positive, liked to meditate." Those inmates "did not observe him to be acting differently or having any issues." A full report by Massachusetts State Police reveals new details Aaron Hernandez's suicide. One inmate, who claimed to be one of Hernandez's closest friends, said he "just spoke with him [before his death] and he was in a great place." "He was a spiritual guy who was always quoting the Bible," the inmate said. "Since Friday's verdict, he had been talking about the NFL and going back to play, even if it wasn't with the Pats." He said he talked about his daughter and spending time with her, and that "there was no indication that he would do anything like that." The file also includes photos of Hernandez's 15 tattoos, which included depictions of a gun barrel and shell casing, tattoos prosecutors had said were references to the 2012 murders of Daniel de Abreu and Safiro Furtado. The photos also show tattoos with religious references. The file has 31 pages of disciplinary records as well, including the final disciplinary report in October when another inmate told guards Hernandez and an inmate were locked in his cell together. "After the unit was secured, I did open Cell 55 and [the inmate] housed in Cell 15 walked out and back to his cell," an officer wrote. 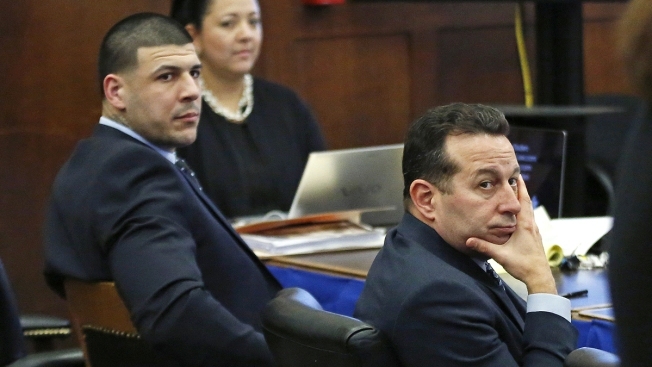 The report states that Hernandez had been written up for acting as a lookout during a fight, for a fight that had to be broken up with a chemical spray, and for hiding a homemade lighter in his waistband. He was also written up for failure to maintain acceptable hygiene. For those incidents, he lost visitation, cell phone, gym and yard privileges. The report also includes music he downloaded for an MP3 player, including "Selfish Girl" and "Unfaithful" by Rihanna, as well as songs by Drake and The Weeknd. The document lists eight boxes of property belonging to him, which includes toiletries, mail and personal photos. It also includes items missing from his cell, such as a Walkman, a chess table game, headphones and a shirt. The Department of Correction denied NBC Boston Investigators' request for Hernandez's call and visitor log, saying they are not public records. However, the report says police listened to seven final phone calls the evening prior to his death. "All content was future oriented and did not elicit any concerns for safety even in retrospect," it said.